As you can see from the map above, Friesland is found in the north of the Netherlands. 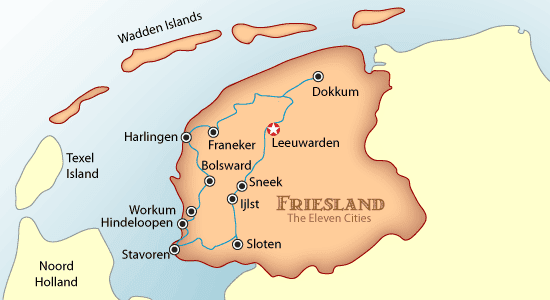 Friesland was once part of the larger region of Frisia. The Capital of Friesland is Leeuwarden, its largest city with just short of 100,000 population. Much of Friesland is made up of lake and marshland and the landscape is verdant green; the Frisian Lakes in the southwest are popular for summer water sports. The West Frisian Islands in the Wadden Sea are a UNESCO World Heritage Site. On the map, you'll see the original 11 cities of Friesland, connected by canals used in the long-distance ice skating event called "Elfstedentocht." You can visit these cities on skates if the ice is thick enough in the winter, but in the summer the options multiply. The tourist bureau lists eleven ways to do the Eleven Cities Tour. We'll start our tour from the capital of Friesland, Leeuwarden, and describe the other cities in clockwise order. Leeuwarden, the capital of Friesland, is accessible by train from Amsterdam and Schiphol Airport--it takes about 2 and a half hours. The population of Leeuwarden is just under 100,000 people, about a fifth of which are students at Stenden University Leeuwarden. You'll find a lively center (once the haunt of the exotic dancer Mata Hari) focused on the arts, shopping and night clubs. For views, climb the "Oldehove" which is called the "Frisian tower of Pisa." On a clear day, the view is out to the Wadden islands (see the map). Sneek is a bit of a boater's paradise (you can rent one, no license required) with a very interesting Water Gate, built in the early 1600s. Sneek is a hub for exploring the Frisian lakes. Canalside cafes, historic facades, and shopping streets--and alleys, make Sneek an interesting destination in Friesland. Near Sneek is Ijlst, so darn pretty with its canal side gardens lined with trees that it's used as a film set. You can visit a sawmill called "De Rat" which is just what you think it is in English, founded in 1638 while your kids visit the interactive Royal Factories J. Nooitgedagt & Zn, a former toy and skate factory turned into a museum. Little Sloten is a small town surrounded by 17th-century ramparts--with canons. It's the smallest of the 11 cities with a population of under 1000 and is located in the midst of a great wooded cycling area. Stavoren is Friesland's oldest city. It was a rich little town until the port silted up. During the summer Stavoren can be reached by ferry for pedestrians and cyclists from Enkuizen. Hindeloopen is famous for the unique paintwork, narrow streets, and wooden bridges. It's inside one of the two national parks in Friesland--ideal for walkers and cyclists. Hindeloopen Art is found in a particular style of painted furniture which started in the mid-1600s and is still produced. Faux marble and scenes from Greek mythology dominate this style. A web page gives you an idea of what's behind Hindeloopen Art. Workum is known for its pottery and for a museum dedicated to popular Dutch artist Jopie Huisman, known for his incredibly detailed portraits and still lifes of everyday objects, as in his famous "worn out underpants" and shoes; he pictured the poverty of his time, the early 20th century. Workum Hotels. Bolsward, a trading city, and port in medieval times, marks the start and finish of a 240 km cycle tour of Friesland, the Eleven Cities Cycling Tour, the cycling counterpart of the Elfstedentocht ice-skating tour. The tour starts on Whit Monday each year. Tourists are attracted to the red brick town hall, built by locals starting in 1614, considered to be the finest Renaissance building in Friesland. Walkers will like the Aldfaers Erfroute, which takes you to several small villages and museums. Harlingen is a seaport city with ferry service to the Wadden Islands of Terschelling and Vlieland. The 'Visserijdagen' is the big summer festival in Harlingen, held on the last week of August. From Harlingen, you can hop on a fishing boat and ply the Waddensea. Franeker, in the center of "mound country," offers the tourist the oldest student pub in the Netherlands, Bogt van Guné (the university is gone, but you can still have a beer). The castle in the center of town is called Martenastins was build in 1498. Each year on the 5th Wednesday after the 30th of June the 'Franeker Kaatspartij' is held. It's a handball tournament on a feast day. Dokkum is a fortified port city with a compelling historic center whose street pattern hasn't changed since 1650. have a coffee in the Markt square at cafe De Refter, once an old orphanage. The unique qualities of the Wadden Sea have made it a UNESCO World Heritage Site since 2010. The shallow waters surrounding the Wadden islands incubate a tremendous sea culture; the North Sea provides sediment and plankton to the sandy mud flats, that are exposed at low tide, forming the food that supplies countless birds, fish, and seals. There are good ferry connections to the Wadden Islands, also called the Frisian Islands. A popular thing to do is to walk the mudflats on an organized tour of around three hours duration. You'll need high-top boots, warm clothing, a towel, and water. A detailed list of equipment you'll need and organizations that provide guides for a walk are listed here: Mudflat Walk Trips. The largest Wadden Island that is not part of Friesland is Texel Island, shown on the map. Texel Island is a good place to rent a vacation home: Texel Island Vacation Rentals (book direct). You can get from Noord Holland (North Holland), shown on the map, to Texel Island via ferry from Den Helder. Then you can go on to the other Wadden Islands on inter-island ferries, or get a ferry to Harlingen.